Farro (which I recently learned is pronounced FAR-ō, not FAIR-ō), is a wonderful way to substitute a nutty grain for rice in risotto. I used it in last year's Multi-Grain Risotto and wanted to give it another shot with different flavors. It's typically semi-pearled, meaning part of the bran has been removed. This helps it cook faster than say, wheat berries, which are not pearled. However, that also means that technically farro isn't a whole grain unless you find an unpearled variety somewhere. I've paired it here with pancetta, which is an Italian meat like bacon but not smoky, and kale, the hearty green that's getting so much attention at the moment. You could certainly mix this up: use bacon or ham or omit the meat to make it vegetarian. Other greens like escarole, spinach or mustard greens would be good in this dish too. 1. Rinse farro then soak in about 4 cups of water. 2. Combine chicken broth with 2 cups of water and warm over medium-low heat in a medium saucepan. 3. Heat a Dutch oven or large sauté pan over medium heat. Add pancetta and cook until crisped and brown. Remove with a slotted spoon and set aside. Remove excess rendered fat to leave about 1 tbsp. in the pot. 4. Add butter to pot with rendered pancetta fat. Add onion and sauté until softened, about 5-8 minutes. Drain farro and add to pot. Cook, stirring occasionally to toast, about 5 minutes. 5. Add pancetta back to the pot, then add the white wine. Stir frequently as the wine cooks down until the point when a spoon swiped across the bottom of the pot leaves bare pot that isn't immediately covered with liquid. Then, start adding the warm broth by the ladle, stirring to incorporate and cooking until each added ladle of liquid is incorporated so that the bottom of the pot can be seen when a spoon is swiped across it. Continue cooking and adding liquid until the farro is cooked enough to still be a little chewy (you may not use all of the liquid), about 30 to 35 minutes total cooking time. Add the kale and cook until wilted, about 5 minutes. Stir in the parmesan cheese and serve. 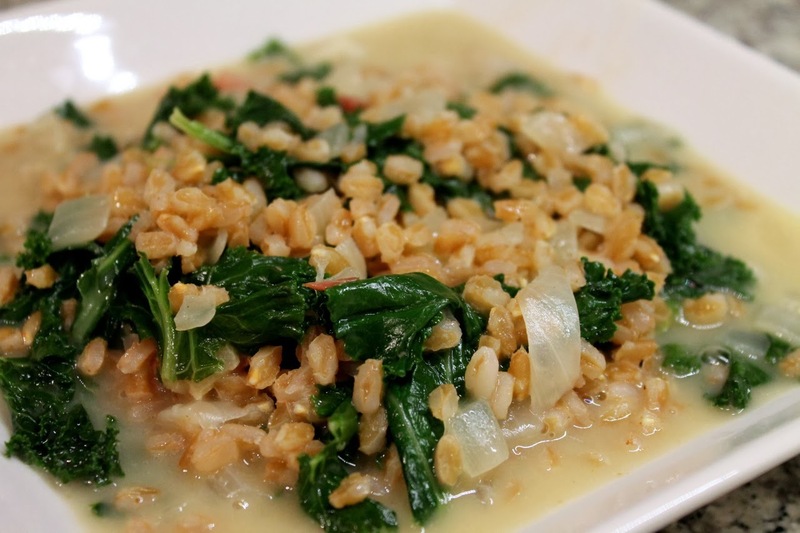 Farro AND kale? This must be the trendiest dish around town!